I love to make meals with fresh, local ingredients! 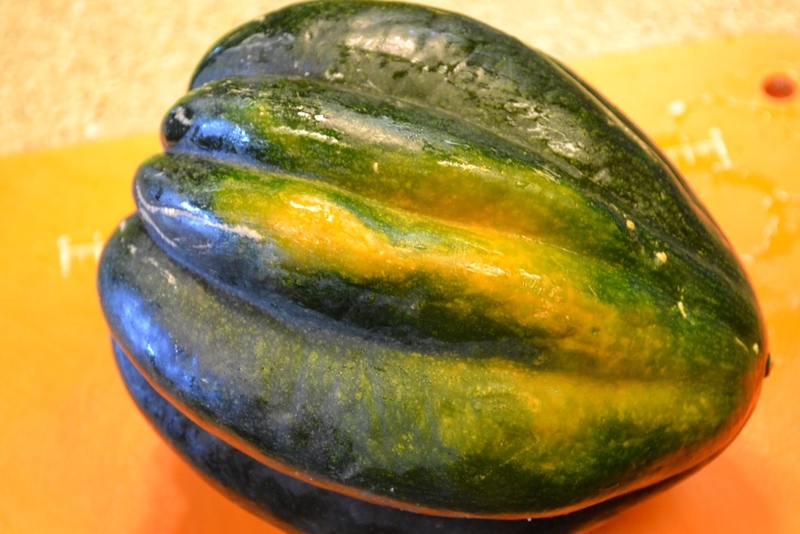 Winter squash is at it's best in the fall when prices are the lowest, and winter squashes are the sweetest! This meal really hits the spot on a cool, crisp night! Momma made stuffed acorn squash filled with a ball of sage sausage, baked till tender and sprinkled with brown sugar. 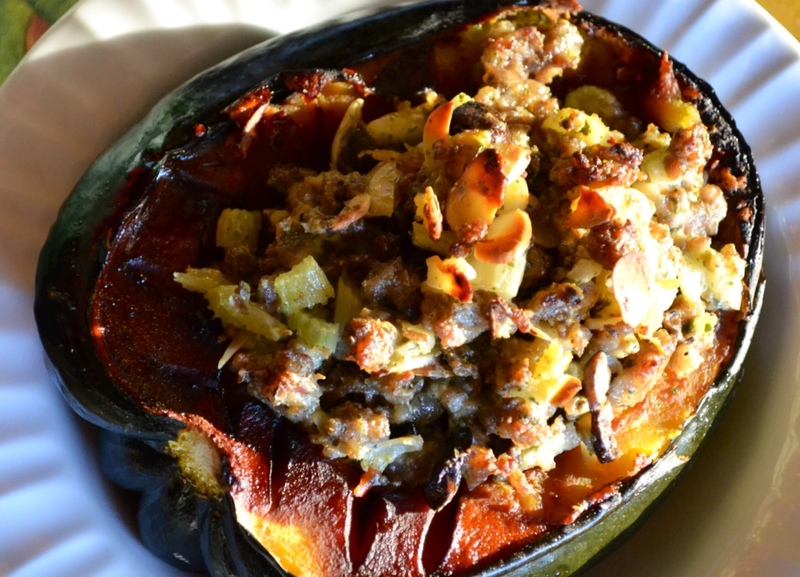 Here's my take on Stuffed Acorn Squash! When I think of Autumn, this meal comes to mind! It's been my family's fall favorite since my kids were little, and now my sons even make it for their families! 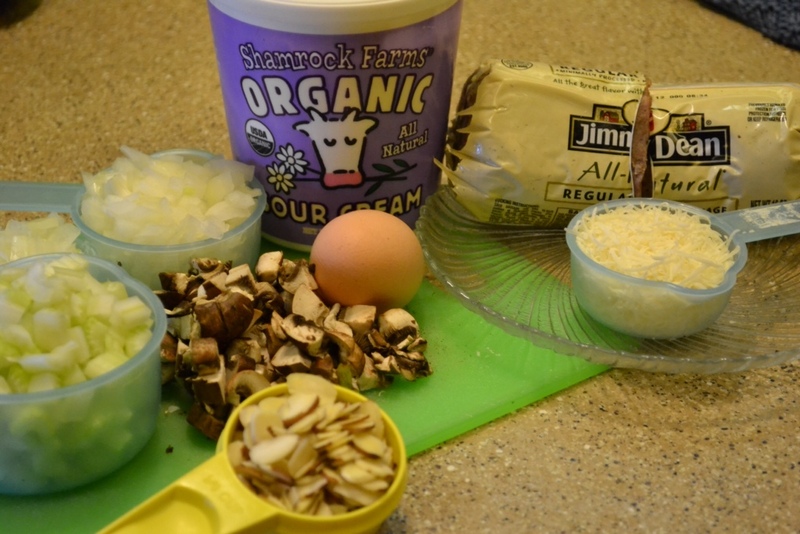 Onions, celery, mushrooms, slivered almonds, organic sour cream, Parmesan or pecorino Romano, and Jimmy Dean All-Natural regular pork sausage. I'm picky about my ingredients! Most sausage contains MSG. I have found Jimmy Dean All-Natural at Walmart for the same price as the stuff with additives and preservatives and Shamrock Farms Organic sour cream for only 10-cents more than regular sour cream. Taking the time to read labels is a great habit to get into. Natural ingredients always taste better and are better for you! 2 tablespoons brown sugar, divided among 4 squash halves. 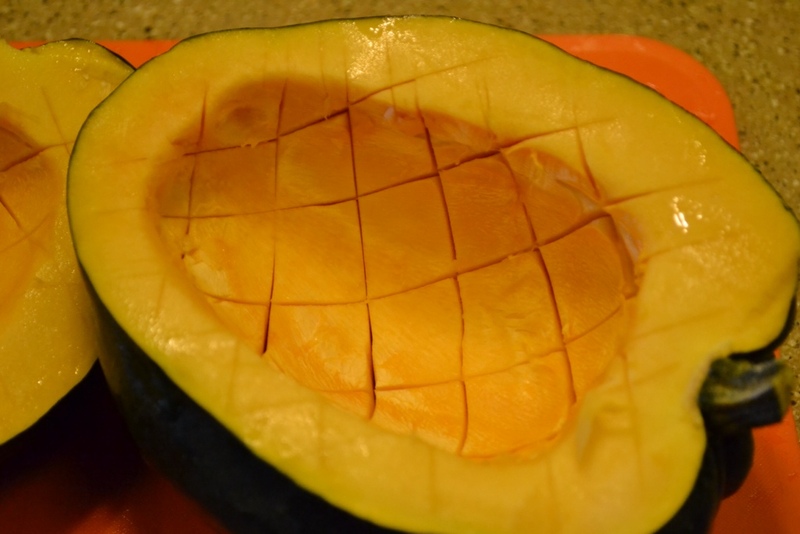 Wash squash; cut in half with sharp knife, cutting between ribs. Clean out seeds; score 1/2-inch deep, salt and pepper and rubbing brown sugar into scores. Level bottom of squash by making a shallow slice across the bump (see photo) to keep filled halves standing upright. 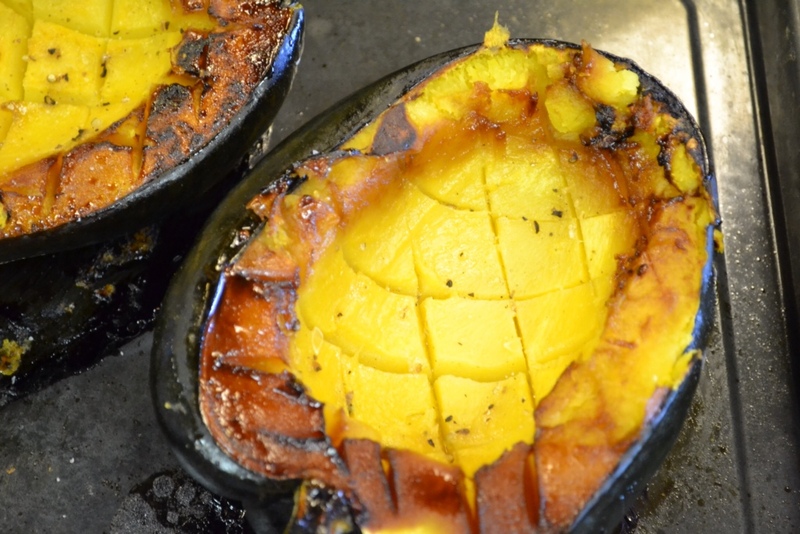 In a baking pan: Place squash halves flesh-side down, covering tightly with aluminum foil. While acorn squash is baking, prepare Stuffing (see instrucions below). Bake for 1 hour, or until fork tender. An acorn squash will have orange on one side to indicate it's ripe. 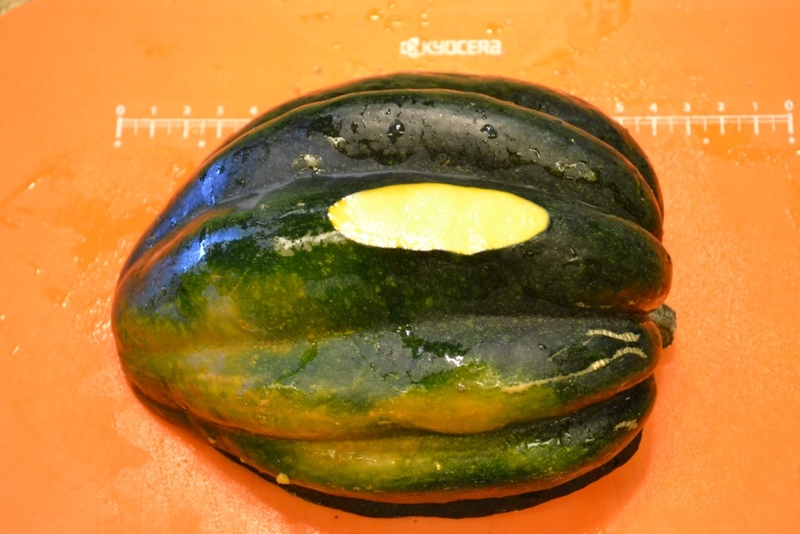 Acorn squash scored with a sharp knife. Note: Acorn squash isn't as sweet as butternut squash. 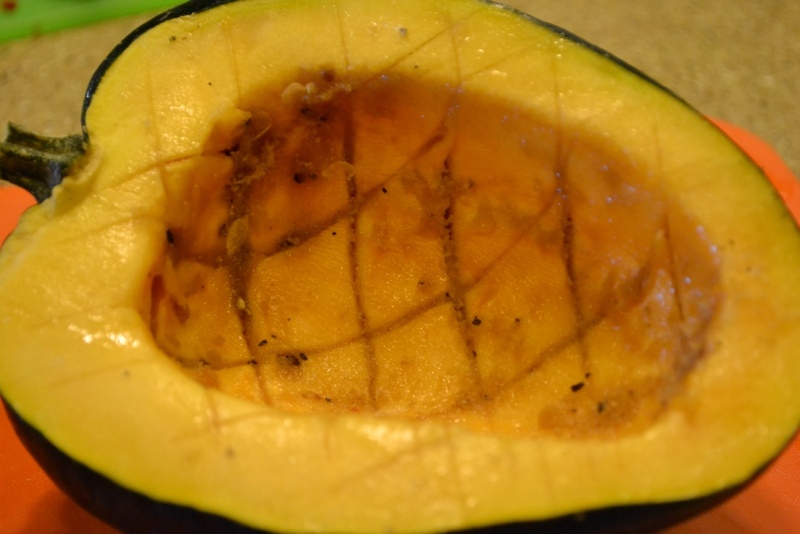 Rub salt, pepper and brown sugar into squash and scoring. Level bottom of squash so it stands upright when filled. Bake flesh-side down in baking pan, tightly wrapped in aluminum foil. 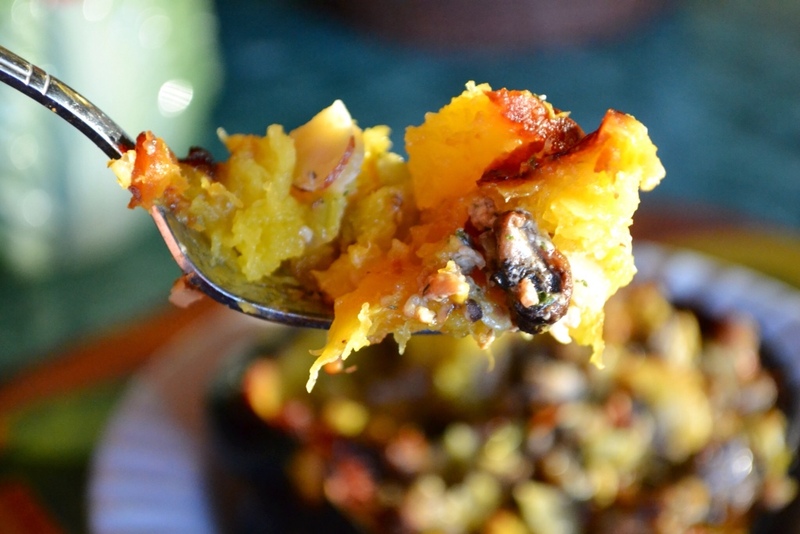 Gently turn over acorn squash using a spatula, and fill with prepared stuffing! In a large frying pan: Sauté sausage and onions with1/2 teaspoon salt and a pinch of dried chili flakes on MED-HIGH heat for 5 minutes. Add celery to sausage mixture and sauté for 3 more minutes. In a small frying pan on MEDIUM heat: Add 1 tablespoon butter; sauté mushrooms and slivered almonds cooking about 3 minutes, while stirring. 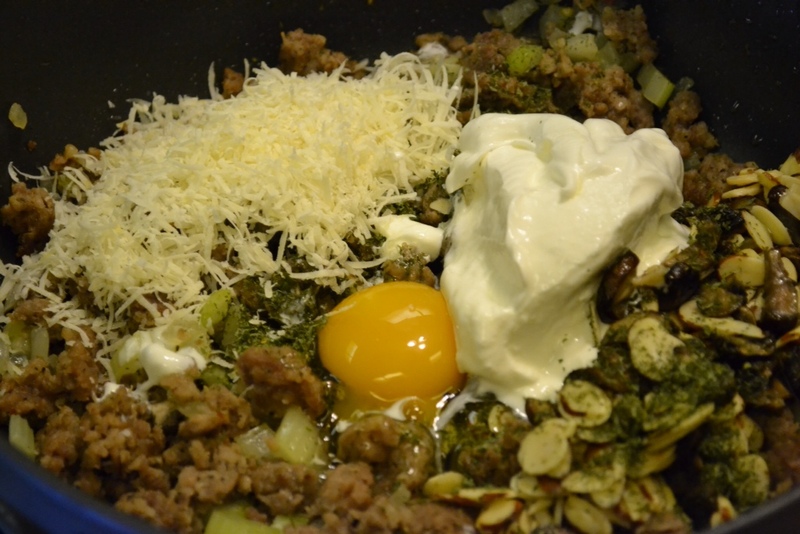 Add mushrooms, almonds, parsley, sour cream, grated cheese and egg to sausage mixture and mix well. 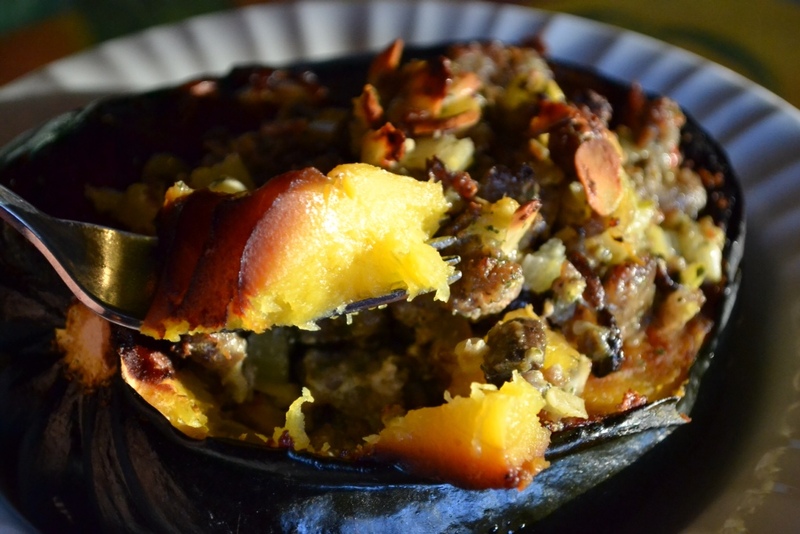 Spoon stuffing into baked acorn squash. Bake uncovered at 350F. for 20-25 minutes or until browned and crispy on top. Serve with extra brown sugar. Major ingredients, plus red pepper flakes, parsley and brown sugar. 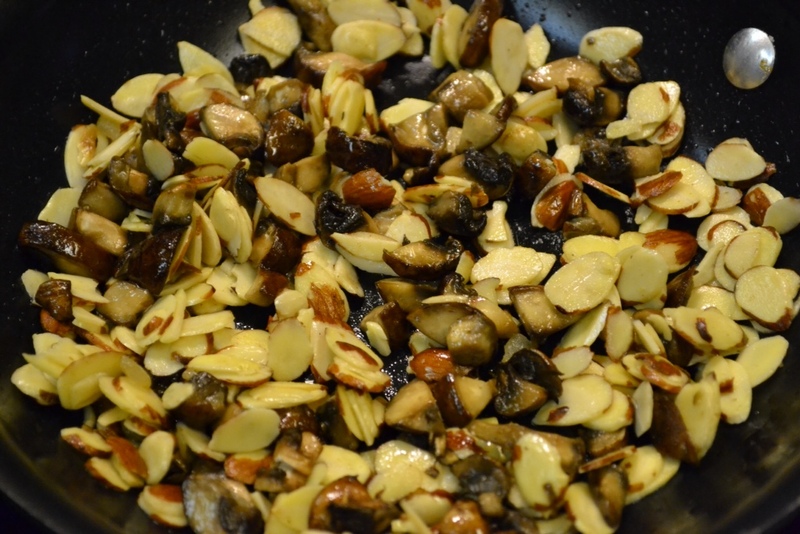 Sautéing mushrooms and almonds in butter. Stir mushrooms, almonds, sour cream, grated cheese, egg and parsley into sausage mixture. Mix it up, sprinkle with a bit of brown sugar and enjoy! I can't say enough good things about this meal! The presentation is beautiful, the flavors savory and sweet, and loaded with veggies! This is a favorite Over at Julie's and know this will become a Fall favorite at your house too!!! That's one of Jason's favorite dish. Everytime he makes Stuffed Acorn Squash for you guys, he calls me from the store to make sure he gets all the necessary ingredients! This recipe is definitely a winner!